Britain’s largest ever purpose-built cruise ship has arrived at its new home port of Southampton, UK on March 6th, 2015. P&O Britannia arrived in spectacular style and for once with bright blue skies. Around Afternoon time the 142,000 gross ton ship made its way to the Ocean Terminal but it wasn’t just any procedure as it’s the first time the UK-based vessel arrived into the UK before its huge Royal christening. There were crowds of people watching the new cruise ship as it showed off two new look blue funnels and a huge Union Jack flag on the bow. Tug boats welcomed the ship by shooting water which is traditional but with the blue skies and sun it made it an arrival like no other. There were Union Jacks everywhere and twitter came alive with patriotic tweets towards the 3,647 passenger vessel. Parachutists from The Princess of Wales Royal Regiment also welcomed P&O Britannia and matched it perfectly by also showcasing the flag. The ship is now docked at Ocean Terminal where the build up to the what will be one of the biggest highlights of 2015 will take place. 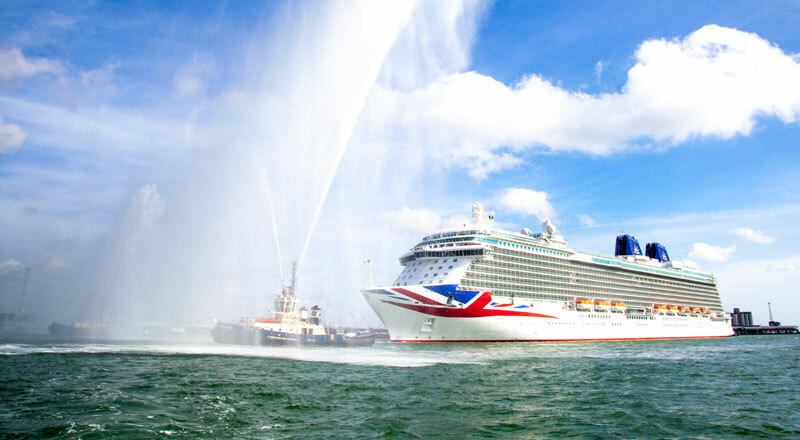 Her majesty the Queen will name Britannia on Tuesday March 10th before setting sail on its maiden voyage on March 14th. The first ever cruise will include Mediterranean calls at Gibraltar, Barcelona, Monaco, Civitavecchia, Ajaccio, Cartagena and Cadiz. The 14-night maiden voyage will end back at Southampton on March 28th.